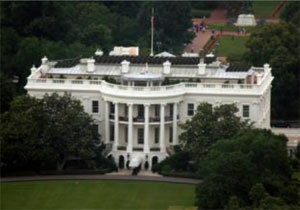 For a 40th Anniversary Earth Day Gift, Solar Companies Offer Free Solar Systems to the White House. A group of solar manufacturers, installers, and solar advocates from across America are offering the White House a unique Earth Day gift: Free solar power systems. San Jose CA April 22, 2010 — Residential solar installer, Sungevity of Oakland California, is offering the White House a free 17.85 kW solar electric system, including inverter technology provided by KACO New Energy, San Francisco. “At Sungevity, we’re passionate about helping people with houses of all shapes and sizes realize the financial and environmental savings that solar provides. We’re proud to offer this donation to the country as a symbol that solar energy should be universally adopted by all homeowners across the country,” says Danny Kennedy, Sungevity’s President. Additionally, San Jose, California-based Free Hot Water is giving the White House a free residential solar thermal system suitable to offset the hot water usage of a family of four, including installation and engineering. “We’re donating this solar hot water system because we believe that getting solar back on the White House is a distinct public symbol of America’s commitment to renewable energy, clean air, and a green energy workforce,” said Paul Burrowes, co-founder of Free Hot Water. Using modern monitoring technology, the White House will be able to show its energy and CO2 savings for both solar electric and hot water systems. In addition, a White House website could be created to further educate the public about key solar policies, such as net metering and feed-in tariffs, and other financial resources such as Property Assessed Clean Energy (PACE), the 30% federal investment tax credit, and local incentive programs across the nation that are making solar affordable to homes and businesses. A solar hot water system was briefly installed on the White House roof in the 1970’s, but the system was quietly removed in the 1980’s. In 2003, the National Parks Service installed a small solar electric and solar thermal system on a White House grounds maintenance shed, which are still functioning today. The solar advocates involved with this initiative strongly believe that solar should be returned to the White House roof. Sungevity has also created a petition website, solaronthewhitehouse.com, which asks President Obama to put solar back on the White House. The website shows an estimated iquote for the White House system, as well the equivalent quote for their solar lease. A Facebook page, “Americans Putting Solar Back on the White House,” has also been created, where other solar companies and solar professionals and individuals have signed up to show their support for getting solar back on the White House. Free Hot Water engineers design custom systems for each unique application. Products include solar thermal panels, custom mounting systems, storage tanks, heat exchangers, circulation pumps, controllers & stations, insulated stainless steel flex piping, roof penetration systems, solar charging stations, tools, sealants, adhesives and cleaners. Free Hot Water products are used by distributors, independent dealers, retail outlets, installers and contractors. Free Hot Water works with a worldwide network of distributors, independent dealers and installers to support Commercial, Residential and Municipal customers with purchasing decisions and installations. We are always looking for dealers and experienced professionals to work with us. Find out more at www.freehotwater.com. About KACO new energy, Inc.
A powerful partner for PV system solutions, KACO new energy has built a tradition of excellence in the photovoltaic inverter and power electronics industries. Our German-based factory engineers have been developing, designing and manufacturing current inverters and power electronics for more than 60 years. The KACO blueplanet product family has set new standards in photovoltaic applications – particularly in reliability, efficiency, power density, and patented technology to meet NEC requirements. As the heart of your photovoltaic installation, your KACO inverter pumps electricity into the public grid continuously and efficiently. The efficiency of the KACO blueplanet inverters will earn you money and a solid return on your solar investment. Additional information about KACO is available at www.kaco-newenergy.com. Sungevity is a solar sales company, with a mission to take solar to the mainstream market. The company has a strong team that brings together successful start-up experience, environmental leadership and solar industry knowledge. Sungevity has designed and launched a unique online sales process to make it easy and affordable for homeowners to go solar. Visit www.sungevity.com for more information.